Courtesy of the Corney & Barrow Burgundy 2007 tasting. I have to confess that despite 17 years of endeavours to know every good Burgundy producer Pierre Labet passed me by. And what an error. Pear, seaweed, potent, limestone. 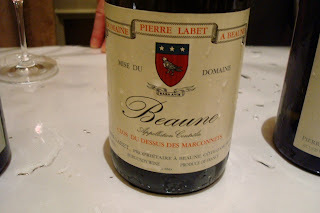 This is a crisp, traditional chardonnay from the Beaune terroir which makes it an ideal food wine. Picked in mid-September which accounts for the potency.